The following American submarines have been lost since 1900, listed chronologically by date of loss. When the date of loss is not precisely known, a "best guess" date is given. See also our Lost Submarines by Month page. The "Men Lost" column below lists only the number of men who died as a result of the sinking, including passengers (civilians, foreign nationals, and Army personnel), as well as men who later died as POWs. These figures do not include men lost in events that occured prior to the loss of the vessels. However, those men are included with their shipmates on the pages for the individual submarines linked to below. If the numbers of men lost as shown on this page appear to conflict with those found on other sources, please see our Discrepancies in Numbers of Lost Submariners page for further information. Please view the "Additional Losses" pages for listings of men were lost while serving on vessels that were not sunk. The 26 men who died on USS Bass (SS-164) are listed on an individual page. *One man was killed by enemy gunfire 12 days before the boat was lost on the same patrol. If he is included, the number of men lost with Amberjack would be 73. USS D-2 (SS-18) (formerly Grayling) - sank at pierside with all hands aboard at New London, Connecticut, on September 14, 1917. Her entire crew was rescued. She was refloated, repaired, and returned to service. ex-USS G-2 (SS-22) - decommissioned vessel that sank in Long Island Sound as a test vehicle on July 30, 1919. Three men lost. USS R-6 (SS-83) - sank at San Pedro, California, due to a malfunction in one of her torpedo tubes on September 26, 1921. She was refloated on October 13, 1921, and returned to service. Two men, John Edward Dreffein and Frank Amzi Spalsbury, were lost. S-48 (SS-159) (pre-commissioning) - sank in Long Island Sound during builder's trials by flooding through a ballast tank manhole cover on December 7, 1921. All aboard escapred through a torpedo tube. The boat was commissioned on October 14, 1922. No men lost. 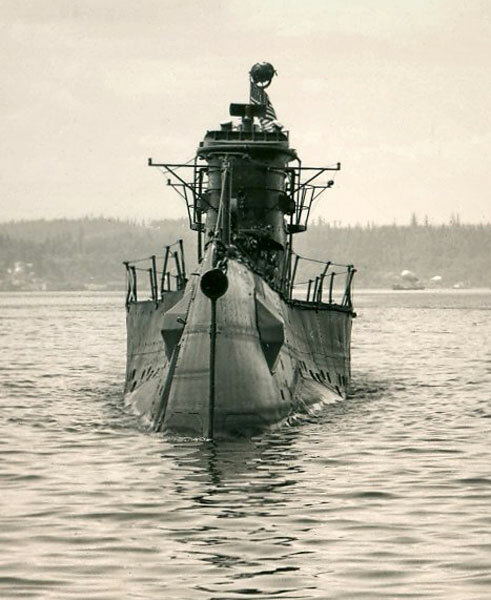 USS S-38 (SS-143) - sank in Anchorage Bay, Alaska, alongside the tender USS Ortolan on July 17, 1923, when a crew member removed a valve cover, flooding the motor room. No men lost. ex-USS R-8 (SS-85) - decommissioned vessel that sank at her moorings in Philadelphia on February 26, 1936. No men lost. She was later raised and used as a target. USS Bass (SS-164) - used in limited capacity after the fire that killed 26 of her crew on August 17, 1942.
ex-USS S-49 (SS-160) - decommissioned vessel that was apparently reacquired by the Navy about 1941, "as equipment," for use in experimental work at the Naval Mine Warfare Proving Ground, Solomons, Maryland. Shortly after being towed to Solomons from Baltimore, the former S-49 foundered off Point Patience in the Patuxent River on December 16, 1942 and sank in 102 feet of water. No men lost. USS Salmon (SS-182) - used in limited capacity after her last war patrol (September 24-November 3, 1944) due to severe damage from enemy action. No men lost. USS Halibut (SS-232) - used in limited capacity after her 10th war patrol (October 8-November 19, 1944) due to severe damage from enemy action. No men lost. USS Lancetfish (SS-296) - flooded through an aft torpedo tube and sank on March 15, 1945. She was raised eight days later and decommissioned March 24, 1945. She was in commission for only 41 days. No men lost. ex-USS R-1 (SS-78) - decommissioned vessel in Key West, Florida, that sank in shallow water on February 21, 1946. She was raised and sold for scrap on March 13, 1946. No men lost. ex-USS Tarpon (SS-175) - was decommissioned on November 15, 1945, and then served as a training vessel for the 8th Naval District. She was sold for scrap on June 8, 1957. She foundered south of Cape Hatteras, North Carolina, while being towed to the scrap yard on August 26, 1957. No men lost. USS Chopper (SS-342) - service life shortened after suffering damage in an uncontrolled dive and ascent on February 11, 1969. No men lost. Guitarro (SSN-665) (pre-commissioning) - sank at the pier at Mare Island Naval Shipyard due to a combination of unfortunate actions by shipyard workers on May 15, 1969. No men lost. The incident delayed her commissioning until September 9, 1972.
ex-USS Bugara (SS-331) - sank while under tow to be used as a target near Cape Flattery, Washington, on June 1, 1971. No men lost. USS Thomas A. Edison (SSBN-610/SSN-610) - service life shortened after suffering damage in a collision with USS Leftwich (DD-984) on November 29, 1982. No men lost. USS Nathanael Greene (SSBN-636) - decommissioned instead of being repaired after a grounding on March 13, 1986, to conform to SALT agreement. No men lost. USS Bonefish (SS-582) - declared a functional loss after suffering a fire on April 24, 1988. Three men lost, listed on "Additional Losses - Post-WWII." USS Baton Rouge (SSN-689) - service life shortened after suffering damage in a collision with a Russian submarine on February 11, 1992. No men lost. USS Miami (SSN-755) - decommissioned instead of being repaired after suffering a fire on May 23, 2012. No men lost. Polish ORP Jastrząb, formerly British RMS P.551, and formerly USS S-25 (SS-130) - scuttled after being badly damaged by friendly fire from HNoMS St. Albans and HMS Seagull on May 2, 1942. Five men lost. British RMS P.514, formerly USS R-19 (SS-96) - rammed and sunk by the Canadian Navy minesweeper HMCS Georgian on June 21, 1942. All hands (at least 37 men) lost. Pakistani PNS Ghazi, formerly USS Diablo (SS-479) - sank under mysterious circumstances on December 4, 1971. Ninty-two men lost. Peruvian BAP Pacocha (SS-48), formerly USS Atule (SS-403) - accidentally rammed and sunk by Japanese fishing trawler Kyowa Maru on August 26, 1988. Eight men lost.